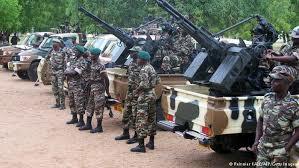 Home World News Cameroon’s Receives 6.86 Million Euros From China For security Enforcement. Cameroon’s Receives 6.86 Million Euros From China For security Enforcement. Cameroon faces armed challenges in the Far North region, where jihadists from neighboring Nigeria’s Boko Haram are active, and in the Northwest and Southwest regions, where separatists from the English-speaking minority have launched an insurgency. The government first dismissed the video as a fake, but President Paul Biya later ordered an investigation.The army has been accused of serious human rights abuses in areas where troops are active, including filmed extrajudicial killings of women and children put on social media and condemned by Amnesty International on July 12. About 10 challengers have submitted their candidacy applications to Election Cameroon (Elecam), the body organizing the poll. Final approval or rejection is down to the Constitutional Council.